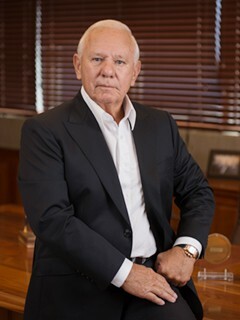 Bob Roscioli started his career in the marine industry as an apprentice in 1962. Within a year's time he began to develop the painting technique that would launch his world-renowned marine companies, Roscioli Donzi Yachts and the Roscioli Yachting Center, Inc. Today he applies his vast experience, technical knowledge, and unparalleled standard of excellence into all facets of custom yacht building and yacht maintenance. Bob sets the benchmark for quality. He personally checks each project, step-by-step, to ensure that only the highest standard of quality and craftsmanship is maintained or surpassed. In 1987, Roscioli International, Inc. designed and built the first of it's fleet of Sportfishing yachts. The Donzi by Roscioli trademark proudly stands for classic, fluid lines, rugged "go anywhere" seaworthiness, impressive nimbleness, and the ultimate in finishes and interior appointments. Every detail is impeccably executed; living and entertaining salons that reflect the elegant and opulent lifestyle of the owner, magnificent entertainment systems, seamless walls of polished hardwood with never the hint of a fastener, imported leathers and fabrics, electric wiring and cables dressed in unison and turned with military precision, glistening white and stainless steel engine rooms and a bridge that means business. Donzi's by Roscioli are first and foremost competitive Sportfishing machines, designed to move through the sea with grace, speed and self-assuredness of a thoroughbred. They are, after all, born to an elite class. The Roscioli Yachting Center represents a state-of-the-art, multi-million dollar, full service yachting facility. One hundred and fifty men and women make up the Roscioli Team. They are computer design specialists, carpenters, electricians, welders, captains, painters, mechanics, interior designers, furniture makers and propulsion specialists - all masters of their trade. The yard is a beehive of activity, productivity and most of all unmatched craftsmanship. Have you ever seen a 260 pound bronze propeller tuned by an old salt with the hands and acuity of a surgeon? A project that may be started on a computer is always finished to perfection the old fashioned way, by a skilled craftsman with a learned hand and an uncompromising eye. The yachts that cruise in for repairs, remodeling or refinishing seem to stand a lot taller when they leave this yard.